The lights blink inside but dont show any function outside. As per the problem,it can be the issue with faulty turnsignal switch or the problem relates to faulty blown out fuses. Check in the fuse box,both under dash and under hood fuse box. The turn signal switch is also called Multifunctional or combination switch. If these switches and fuses checked ok,then other possibility is blown out or faulty bulbs.Get confirmed that bulb/lamps are working ok. If bulbs also checked ok,as they work else where but not in turn signal and flasher positions,then the problem is related to modules. On your vehicle model,which is Chrysler Pt Cruise year 2006 there are three modules. Any of the one if get faulty then such problem can definitely occur. Below i have described more about these modules. 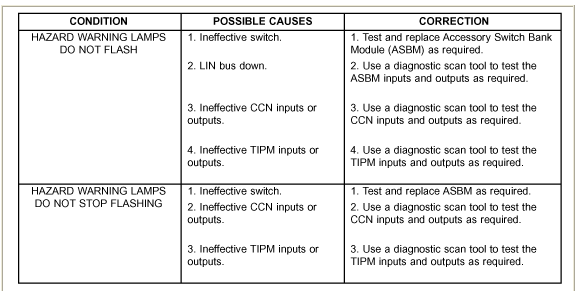 Testing needs to be done to the ASBM (accessory switch bank module) & the TIPM (Totally Integrated Power Module). BCM is called Body control module. These modules can be tested with factory service scan tool. Before performing the following tests, confirm whether the left and right turn signals operate satisfactorily. If the turn signals are inoperative or operate improperly, diagnose and repair that problem before attempting to repair the Hazard Warning Lamps. See below the chart showing what possibilities are there to confirm the problem.